Unfortunately, there will be PS exclusive stuff. Only watched the first 2 minutes but, WOW. . . looks pretty good so far. Well, i will wait. The history learned me, dont trust bungie. They lie when they open the mouth. They a clever in generate wohoo and wow effects. Anyway, the fu**ed me again. I am PC player and have to pay the same money than PS4 gamers and get less, gear, less strikes less sh*t.
No, you'll get it, just a year later than the PS4 people. I am not a fan of platform specific exclusives. But Sony paid to do it to try to entice people to buy PlayStations. Wow... I was expecting big things, but this is crazy! Power weapons in the Kinetic and Energy slots? New super abilities? BOWS? PVP AND PVE INVOLVED IN THE SAME ACTIVITY? I'M SO READY. Must say that I'm a bit confused about the plot of this expansion. We're obviously going to the Reef, but with who? Fighting who? For what goal? Hopefully they'll release something more comprehensive at some point. All in all, Destiny 2 does not feel forsaken, not that it ever did. I can't see anything that hasn't been touched on. ... I'm a bit confused about the plot of this expansion. Isn't it like that in every Destiny expansion? Well, the hype train is definitely at full steam. Strangely ... it didn't excite me. I think I'm going to get off at the next station. I have a few things I still want to do in the game, but when those are complete I think I'm done. Maybe I'll join back up later after the real player reviews start rolling in. Maybe I'll wait longer until they start discounting the passes. Not really. Most of the expansion teasers provided the grounds for a basic description of the story, but I couldn't even see that in this Vidoc. But hey, I'm not hung up over it. It won't excite everybody, but that's okay. We've got a long time to wait anyway, so there's plenty of reason to be apprehensive. Same... but it is nice to see Bungie pay respect to Destiny 1 players with their next DLC name. forsaken for·sak·en (adjective): abandoned or deserted. I'm cautiously optimistic as usual. Collections, new weapon types, and the new/old weapon system seem promising. I'm very interested to see more of these new supers. The Stormcaller and Voidwalker ones seem super cool, hopefully the Dawnblade one will be able to compete. Long time no see dude! Radiance 2.0, if we're lucky? Maybe my efficiency won't go down trying to play a Dawnblade anymore. I burnt myself out and ended up taking an extended hiatus from playing Destiny. But hopefully I'm back this time, in preparation for September. Reddit seems to think that the Dawnblade stabbing the ground at 8:24 may be indicative of their new Super option because it doesn't seem like a regular Phoenix Dive stab. I'm not sure if that is the case or not, but some iteration on Song of Flame would be awesome for me at least. I 'm just hoping that we'll get a well-rounded Dawnblade option that is suitable towards being supportive. 2:48 is interesting because it looks like the Stormcaller is consuming their grenade to proc Arc Soul, akin to a Voidwalker and I find that quite intriguing. The new abilities will probably get more fleshed out in the coming months, but I reckon that was just a regular Daybreak Phoenix Dive personally. Didn't seem much different. But yes. Dawnblade NEEDS to be reigned back and focused towards support again. INSTANT ARC SOUL SUMMONING? Yes please. Also the new Voidwalker Super looks SICK. I did like what I saw, however I'm a little cautious given Bungies recent failures. The price though... over here it's 39,- EUR ($45) for the expansion, 69,- EUR ($80) for the expansion & the season pass and 79,- EUR ($92) for the deluxe edition. That's a whole lot of money, I'm especially curious over the season pass. If they keep doing events in their recent pace I'll probably get 2 events for 30 bucks. After watching it in it's entirety last night. It says and does all of the right things for sure. . . But as most have already said, I'll wait it out and see what ACTUALLY ends up happening. Too many damn good games in that release window (RDR2, Spiderman By INSOMNIAC/SONY, Shadow of the Tomb Raider, and rumored possibilities of a new Fallout and/or BorderLands games. ), to be throwing money at Bungie right now for me. But I'll definitely be keeping an eye on it. + Battlefield 5! Fallout 76 - I've heard a rumor, that it will maybe be a multiplayer.. don't like the sound of that, elder scrolls online was a massive failure if you ask me.. But I love Fallout! Thanks for answering one of my questions , Xbox will get the yr 1 Exclusives in Sept. I am excited we are getting compound bows , being a 3d target archer this is my forte' now look out !!! Yeah, I too unfortunately bought Elder Scrolls Online. Big waste of time and money. I forgot all about BF5. I get burnt out on mp shooters very quickly anymore. Probably part of it is because as I age my motor skills aren't as sharp as they once were. Especially my eyesight. Sadly my once ungodly K/D ratio from the BF1942/BF:Vietnam days has sunk worse and worse with each passing year, lol. Destiny is one of the few mp games where I can compensate for this a lot by knowing the encounters/maps like the back of my hand. I'm okay with the pricing. I'll put in US dollars. 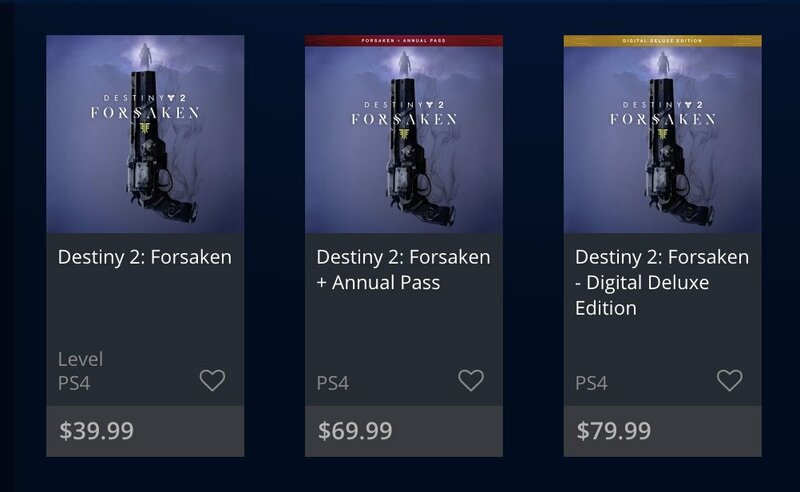 $80 for another year of Destiny. It is STILL the cheapest $/hour played game I own. They said the compound bows will be PS exclusive for 2 years. I am cautiously optimistic as well. But I have faith that they've heard what the community has said and will start delivering on that. There will be in influx of new possible great games coming out (I'm looking forward to Fallout 76). We'll see what happens. But from what I've seen, I'm excited and I stowed away on the hype train. i'm going to get the $80.00 digital deluxe as well times 2 , I 'll also have the PS exclusives to look forward to ,can't wait ,may have to put in for some vacation days !! I keep thinking about the new Gambit gamemode. Two teams of four collect motes from minions of darkness to trigger a boss. You can send one member of your team to the other team's map to invade. It seems that the invader is red and can probably steal motes from the players they kill. You're basically invading like in Dark Souls. Now if I could just get some of my old Sunsinger skills back, we'd be able to participate in some Jolly Cooperation. You probably have already seen this information elsewhere, but I'll post it here for record purposes. I've been rounding up some info from various videos and Reddit regarding the new Supers and subclass options coming with Forsaken. Sunsingers, rejoice! So it turns out that the new Dawnblade super is called [Well of Radiance], the Dawnblade stabs their Daybreak sword into the ground creating a larger version of Rift that provides BOTH Rift effects and lasts for 30 seconds (sometimes more for some reason). There is also a small solar explosion with some knockback on the initial cast. I've been hearing that the damage increase might be more than 20% and that the healing seems to be stronger than a normal Rift as well. Their melee seems to provide a temporary damage buff to you and your nearby allies for about 4-5 seconds. Dawnblades are also getting access to a "grenade overcharge" ability (like Voidwalker and the new Stormcaller one that spawns an Arc Soul) that lets them turn their grenade into a sphere that provides overshielding to your or allies that walk through it. You get to throw this sphere out too, so you can throw it at your feet or toss it out in front of you. Their last ability is a perk called [Hearthkeeper], whenever an ally is shielded by your grenade conversion effect, whenever they step into your Well of Radiance or Rift, OR whenever you provide your melee buff, you get a 5 second buff that apparently recharges all three of your abilities grenade, melee, and Rift. And this isn't some measly refund, you get about HALF your ability energy back. With proper management, we should be able to have near constant cooldowns... which is insane. We also have some more information on Nightstalker. Their super is called [Spectral Blades] and it is essentially a Void Version of Arc Blade from D1. On cast you pull out a pair of "knives" (they're really big) and go invisible. You can then proceed to stab people with a L1/LB light attack, similar to D2 Bladedancer, or use a heavy R2/RT which will also put you back into stealth. They have a passive perk called [Veil of Night] which will highlight enemies through terrain. It seems to pulse after crouching for some time in addition to being active during your super, but this needs more confirmation. There is also a perk called [Thrill of the Hunt] which seems to proc after you Dodge, but the effects aren't listed. Even more obscure is their melee which is also unknown. We also know a bit more about Striker. Their new super is called [Thundercrash]. They basically get their 1-shot Fist of Havoc back, but with more range and they can guide it to an extent. And their melee ability is like a watered down version of Death From Above. It has a reasonable AoE (unsure if it is affected by height) but it does regular charged melee damage.